FAIRFAX, VIRGINIA (The Nil Admirari) - The National Rifle Association (NRA) announced today it had a press release ready and waiting for the next mass shooting in the United States. 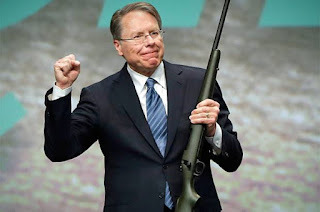 NRA Executive Vice President and CEO Wayne LaPierre stated such preparedness was essential to highlight why victims of gun violence were negligent for not arming themselves. "The NRA will continue to educate Americans about their Second Amendment rights by using these horrible stories about people who failed to arm themselves being shot down by someone who did arm himself," said LaPierre. Lapierre also stated the NRA had streamlined the process for press releases following mass shootings. "We have a great little template set up for mass shooting press releases. All we have to do is change the date, place, number of victims, and maybe some other minor stuff," explained LaPierre. The NRA refused to comment on rumors there was a betting pool within the organization that encouraged the board of directors to select what state would host the next mass shooting.